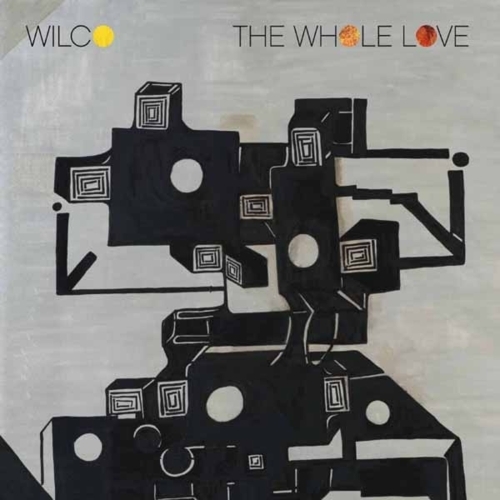 In naming the title track of their new album The Whole Love, I doubt that Wilco had prophecy in mind, but they couldn’t have picked a more apt title. “The Art of Almost” is a thrilling exploration of sonic textures and mashed together rhythms. Ending up in a full on blow out in which Nels Cline is set free for the first (and only) time on the album, it bristles with an energy and a swagger that is more often reserved for the bands live performances. And that energy carries over into I Might, the albums first single that was revealed at their Solid Sound Festival this summer. But it’s a steep drop of a precipice from there on out. And that drop is not for lack of trying, but as a band Wilco seems to have come to an unexpected crossroads in their career. While they still remain a force to be reckoned with on the stage, their last effort Wilco (The Album) was by all accounts a flat out failure. It took everything that had ever been exciting and innovative about the band and stripped it away, leaving collection of songs that were unnecessary as they were uninspired. It was an unexpected plunge to rock bottom for the band, but you know what they say; once you’ve hit the bottom there’s nowhere to go but up. Songs like “Sunloathe”, “Dawned On Me“ and “Capitol City” seek to capitalize on the pop-psychedlia wonder that the band achieved with their 1999 classic, and by far best, album Summerteeth¸but the results end up sounding more like a band who obviously love that record, but have no idea how to create that sort of magic anymore. In fact The Whole Love is steeped in those kinds of flourishes but they mostly sound like afterthoughts to try and punch up songs that might not have been ready to survive in the wild on their own. Perhaps the biggest disappointment here is that once again, the great Nels Cline is for the most part, criminally underutilized. Yes I know that he didn’t join the band until after the guitar heavy A Ghost Is Born, so there’s not much precedence for his playing on the records, but as anyone who has seen the band in it’s current incarnation live can attest, Cline is the bands not-so-secret weapon. Cline’s assaults on his guitar in a live setting brings out the twisted beauty that can be found in even the weakest of Wilco’s songs, and serves to elevate the band to a place they just couldn’t possibly reach before his addition. To either not try or not be able to capture that electrifying energy on record twice now is as unfortunate as it is confusing. If it’s the latter situation that is at player here, then the misstep can be somewhat forgiven. Bands have sought to capture that live energy on record for decades to no avail. But if it is the former, then one has to wonder if Wilco have simply lost their creative guidepost and are drifting aimlessly about a sea of their own success. It’s not all bad though. The one two punch of “Art of Almost” and “I Might” set the tone for a great album that could have been. And the album’s title track, with it’s eye set squarely on early 70’s AM radio is as good a pop song as you’re going to get this year. In fact the reality is that if you’ve never heard Wilco before this would be a perfectly acceptable entry point. The Whole Love is pleasingly safe “Dad rock” that you’re not going to have to think too hard about. And that, I guess is the whole problem. Those of us who have been around since the beginning have come to expect records that challenge our expectations of what a rock/pop song can be. There was always a high bar set for the band, but somehow they always managed to blow right on past it…until now. I’m not going to speculate here as to what the reasons behind this shift in ambition are, but it’s pretty clear that the band who once reached for the stars is perfectly content hanging out in the middle ground these days. To be fair, it’s a solid middle ground, but it’s a place that only almost good records will ever spring from. That’s a place that nobody could have predicted Wilco would end up at, but hopefully what we’re looking at here is merely brief detour in the bands creative output instead of the beginning of a slow decline into irrelevance.